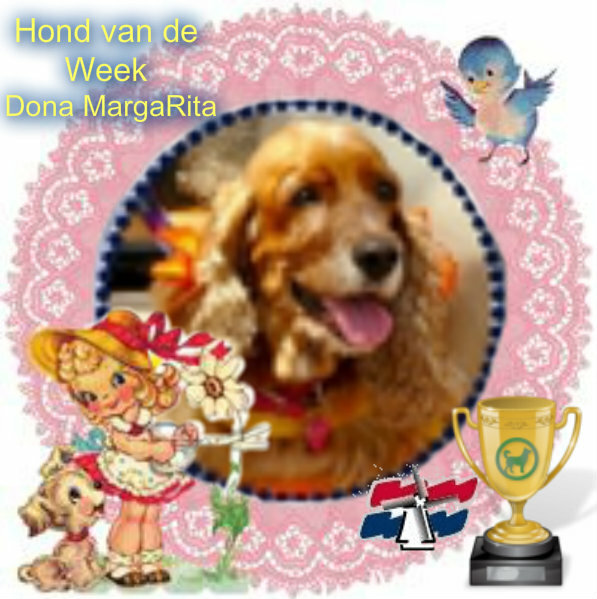 Congratulations sweet Donna MargaritaX on becoming the Dog of the Week on the Dutch speaking site. Are you surprised and what would you like to say to all your friends who remember you and voted for you? We think that up there is very beautiful but we believe that you miss us as well as we miss you. What do you miss the most? What is the bravest thing you ever did? And what is the funniest thing you ever did or happened to you? What fond memories of you your mom can tell us? The bravest thing, leading my illness with great strength, until the end of my days. No one noticed how bad I was. Well something funny ... yes!! I liked running after the pigeons when we went to the park and on one occasion I tangled Brandy JosefinaX & Thomas AlejandroX with my own leash.. Hihi hi hi they were trapped by my. My Donna MargaritaX was quite well educated lady, beautiful and always closes to Brandy JosefinaX & Thomas AlejandroX . she acted like a mother to them. What were your favorite toys and food? I liked to play with all kinds of balls and if they sounded even better. Some of them still remain with Brandy Josefina X & Thomas AlejandroX . My favorite food Meat balls with rice yumi yumi yumi & Chine Food and sweet things like sweet bread with sugar, my aunty Graciela always had one for me when we went to the park & the strawberry ice cream. How did you get along with Thomas AlejandroX and Brandy JosefinaX ? Did you ever play together? Yes, Thomas Alejandro X was very protective, He took care of me during my illness and until my last breath & with Brandy JosefinaX at first it was a bit difficult, she was jealous, in fact once she bit my ear, but she get better behaved as time went on. Yes, we play together most of the time specially when we were at the park with the other friends. What character did you have? Can you please describe yourself in five words or less. I was a very special dogX , Beautiful inside and outside. You have such a beautiful name, how did you get it? Good question, because my dad just gave me the name of Donna, but my mom loves the compound names, she gave me the MargaritaX because I liked flowers. Thank you Donna MargaritaX for taking the time to answer all these questions. We hope you have a pawsome week up there. Finally, what would you like to say to your friends who still remember you? From my Little cloud in the Rainbow, I want to say THANK YOU to all my [email protected] and their mommies. We have gone to the Rainbow but we are always presents here in this site and their hearts. Today I want to thank God for the gift of having a beautiful family.